In Part 1 of this article, we looked at a few practices designed to serve you well and minimize your stress on the roads during the coming back-to-school season. In the interest of making sure that your driving experience is the safest that it can possibly be when it finally comes time for the youngsters to hit the books once again, however, we thought we’d share a few more helpful tips which might make all the difference when things start up again in the early fall. Enjoy! 1. Children can be unpredictable; try to keep an eye out for them. While kids typically have many great qualities, street sense generally isn’t one of them. This means that, even though you might be paying careful attention to the road, a child could ostensibly run out into your path without even pausing to think about it first; kids waiting for the bus are a great example, as one might lead the rest without having them stop to look both ways before running out into the road. 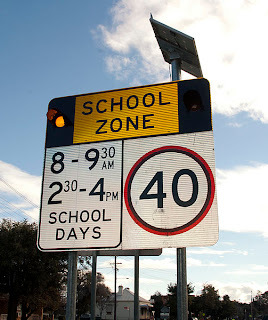 Practice extra precaution when driving through a school zone (see Part 1 of this article for more information) or when approaching a slowing or stopped school bus, as these could be hotspots for child activity in the area. 2. As always, avoid distractions when driving. Given kids’ tendencies toward running first and checking for cars second, a phone or other distracting device could conceivably mean the difference between seeing a child running into harm’s way in time to stop and being a split second too late – a nightmare for any caring and safety-conscious driver. For your own sake, as well as those of children and other commuters, avoid distractions when driving so that you can focus your full attention on the road. 3. Planning ahead means having the time to be safer and less anxious on the road. If you know where you’re going and have the time beforehand, plan your route and make sure that you have everything you need before you get in the car. Following a pre-planned scenario will mean having to devote less time to thinking on the fly, which will free up both time and brainpower to dedicate to the road.